We manufacture and supply wide assortment of Chemical Tanks. One of the best quality raw materials are used in fabricating these high performance and durable storage tanks. These highly durable, super strong, chemical and water resistant storage tanks are available with inner shell along with flat bar ribs to maintain gap on either sides. Our team of professionals conducts numerous quality tests to ensure continuous high performance of these tanks. We are manufactur and supply SS304 & PURE ALUMINIUM TANK for Nitric Acid Storage(cpacity 500 liter to 50kl,) used in array of application like storage, mixing and separation of raw material. Some of the best quality raw materials are used in fabrication of these machines. Our team of experts makes these tanks by following international specifications and stringent quality tests. These durable and low maintenance tanks are designed for easy installation and can be provided with customized specifications. 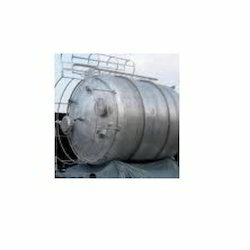 We manufacture and supply wide assortment MS, SS Chemical Tanks. 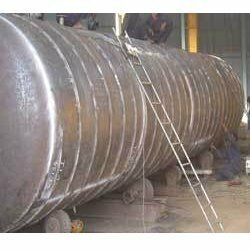 One of the best quality raw materials are used in fabricating these high performance and durable storage tanks. These highly durable, super strong, chemical and water resistant storage tanks are available with inner shell along with flat bar ribs to maintain gap on either sides. Our team of professionals conducts numerous quality tests to ensure continuous high performance of these tanks.We manufacture 500 liter capacity to 30000 liter capacity.